EASY INSTALLION: Easy to install.Find the position where you want to install on the board and drill a hole ,then pass through the screw from the back of board anf thread tight to the knob.Be careful during the work. It is made of zinc and crystal, pretty artistic and durable,which is easy to install. Find the position where you want to install on the board and drill a hole. Then pass through the screw from the back of board anf thread tight to the knob. Be careful during the work. It can create you a better splendid atmosphere. Widly used in cabinets, wardrobe, dresser drawers and any places you want. 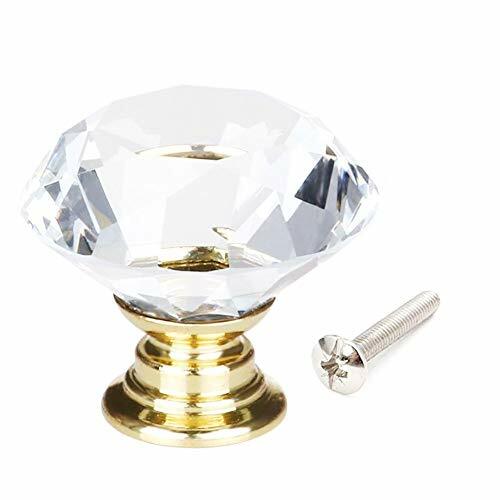 MATERIAL: Clear cut crystal glass and alloy base, shiny polished chrome, glittering and sparking, diamond shape, good decoration for your home or office. Widely Used in a variety of Furnitures: Great for DIY project. Bring classy look to your cabinet, bin, bookcase, doors, dressers, drawers, wardrobe, kitchen, cupboard and more. INSTALLION:Easy to install. Find the position where you want to install on the board and drill a hole , then pass through the screw from the back of board anf thread tight to the knob. Be careful during the work. Shining Appearance and Fashion Design: Perfect texture ensures comfortable and wonderful touch when hold in hand. Great reflection of various kinds of brilliant colors when they catch the light.